Wacky Wednesday to my snaps! Happy Hump Day! Watch out for stray dogs today. You know why. The weather on Man Fuk Road, Homantin, Hong Kong is a partly cloudy 68 degrees today. You may find that name more appropriate for the 405 today, as traffic is bumper to bumper. 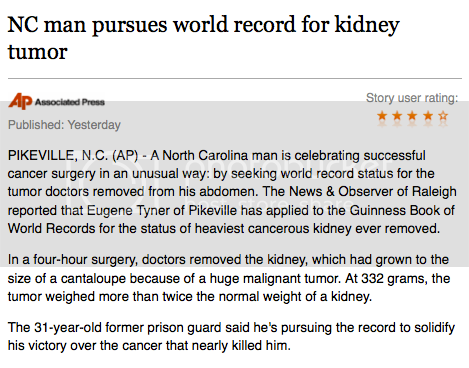 In the news, a cancer patient is celebrating a successful surgery by trying to get his cancerous tumor into the Guinness World Records. The tumor, removed from his kidney was the size of a cantaloupe. In celebrity news, it is being rumored that the reason Billy Ray Cyrus filed for divorce is his cartoon-eyed wife Tish was having an affair with Bret Michaels. Seriously, doesn't she have huge, narrow-set cartoon eyes? Second... I hope she has a lifetime supply of Valtrax cause... she's gonna need it. You know, she really has a point. It is a shame it's politically incorrect to put your child through a wall. Because they might just end up being grammy award winning, multi-millionaires. In Bieber news... sometimes when a Bieber needs to go... he just really needs to go. Someone get that boy to a bathroom STAT. He's only been recently potty trained and can't hold it very long. I'm sorry, that wasn't right. He's still potty training. In most countries, yes. 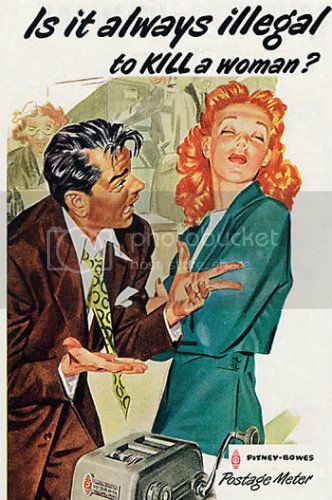 Are you going to kill the woman with a postage meter? I don't get it. That ad is very strange. I would really like to know what its for, because I doubt hit men have ads.